Due to resent volcanic activity, we have modified our tour itinerary and will continue make adjustments based on ever changing conditions. Our Guest and employee safety is our number one priority. Please see below for our itinerary which is subject to change without notice. Just a 45-minute flight from Oahu you will find yourself on Hawaii’s Big Island. Your arrival, into the middle of a lava field, might almost seem like a moon landing. Along the western coast of the island, the landscape changes dramatically. There will be a stop at Royal Kona Coffee in the midst of the coffee-growing region. It’s a remarkable place of organic beauty. The lush coffee bean trees seem to spring up among the other island foliage. The area also overlooks Kealakekua Bay. Hamakua Macadamia Nut Farm* Enjoy Hawaiian-grown macadamia nuts, gourmet coffee & island specialty items. Parker Ranch One of the oldest and largest cattle ranches in the country! Hamakua Coast Home to lush tropical rain forests, beautiful waterfalls, and breathtaking coastline views. Rainbow Falls State Park* A majestic waterfall that cascades 80 feet over a lava cave and where rainbows are often seen in the rising mist. Big Island Candies Factory* A true taste of the islands and home to the world renowned Chocolate Dipped Macadamia Nut Shortbread Cookie. Hawaii Volcanoes National Park* Home to one of the world’s most active volcanoes – Kilauea, along with lava tubes, volcanic craters, scenic vistas, unique flora like giant ferns, hardened lava flows, and more! 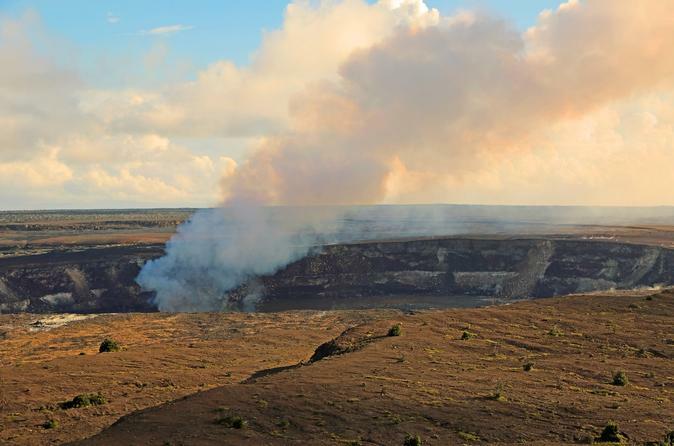 Jaggar Museum and Hawaii Volcano Observatory* Discover the science of volcanology, explore geologic displays and see firsthand the monitoring of the four active Hawaiian volcanoes. Volcanic Steam Vents Feel the heat as you witness volcanic steam seeping out of fissures in the ground along the Kilauea Caldera. Crater Rim Drive Experience the diverse environment around Kilauea’s caldera from the rainforest to barren desert surroundings. Fern Tree Jungle Take in the beauty of the various giant ferns, plants, and trees in the unspoiled environment and experience a piece of the island as it looked to the ancient Hawaiians. Kilauea Iki Overlook One of the most spectacular views in the entire park is from this 400-foot high crater viewpoint. Thurston Lava Tube* Explore a 500 year old lava tube as you walk through where molten lava once flowed and exit into a beautiful lush tropical rainforest. Punalu’u Black Sand Beach* Famous and picturesque, this black sand beach is an unforgettable site where Honu often enjoy basking in the Hawaiian sun. Kona Coffee Plantations* Behold the panoramic farms growing the highly sought after and exclusively grown gourmet Kona Coffee Beans.